There are plenty of good reasons to quit smoking. Here's one more if you're considering replacing a missing tooth with a dental implant: smoking increases your risk of implant failure. By and large, dental implants are the most reliable and durable tooth replacement option, with more than a 95% success rate after ten years. But that still leaves a small percentage that fail — and twice as many of those failures are in smokers than in non-smokers. To understand why, we need to look at how smoking affects oral health. Besides burning and thickening the surface skin cells inside the mouth, inhaled smoke can also damage salivary glands and lead to dry mouth. Reduced saliva creates an environment friendly to bacteria, which increases the risk of infection and disease. The nicotine in tobacco also restricts the myriad of blood vessels that course through the teeth and gums. The resulting reduced blood flow deprives teeth and gums not only of nutrients but disease-fighting antibodies. The mouth takes longer to heal and can't fight infection as well. The key to an implant's success lies with its titanium post imbedded in the jaw bone to take the place of the tooth root. Titanium attracts bone cells, which grow and adhere to the post over a period of time and create a stronger hold. But the health effects of smoking inhibit this process. 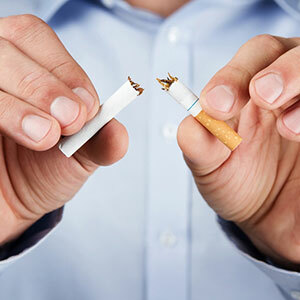 Furthermore, slower healing caused by smoking increases the risk of infection, the number one cause of early implant loss. If you want to improve your chances for a successful implant — not to mention improve your overall health — you should quit smoking. The prospect of a dental implant could be a useful incentive to enroll in a smoking cessation program. At the very least we suggest you stop smoking a week before implant surgery and then for at least two weeks after to help promote good healing. And you should pay close attention to your daily oral hygiene — brushing and flossing at least once — and regular, semi-annual dental visits for cleanings and checkups. Smoking can harm your health. If you're considering an implant, it could also harm your chances of a successful outcome. If you are ashamed to smile because of broken, stained or poorly shaped teeth, it’s time to give yourself a new smile. Cosmetic dentistry is the answer you’ve been waiting for. You don’t have to just live with what genetics or wear-and-tear has done to your smile. It’s time to discover what the right cosmetic dental procedure can do for you. Your dentists at Parker Dentistry in Hollywood, Florida want to help you explore the state-of-the-art world of cosmetic dentistry. Teeth whitening, which can whiten your teeth up to 8 shades whiter; it’s the perfect choice for coffee drinkers, smokers, or aging smiles. You can choose from a speedy in-office treatment that takes about an hour, or a convenient take-home kit containing everything you need to whiten your smile privately at home. Whichever option you choose, the results are dramatic and can last up to 5 years! Bonding, a procedure which can repair small chips, cracks or uneven areas in tooth structure; you can even close small spaces, or cosmetically alter the look of rotated or stained teeth. Dental implants, which can replace a single tooth or multiple missing teeth with a completely natural-looking, stable tooth replacement; with proper care, dental implants can give you a beautiful smile for life! Cosmetic dentistry can give you a new smile easily and quickly. You won’t believe the results a simple procedure can give you. For more information call your dentists at Parker Dentistry in Hollywood, Florida. Don’t wait to get the smile you deserve. Call today! Advantage #1: You'll have a beautiful smile. Dental implants from your Hollywood dentist are carefully crafted to match the color and shape of the rest of your teeth. They seamlessly fill in gaps left from missing teeth, evening out your smile and making it healthy and attractive. They also help to support your natural teeth, which keeps those teeth in place and functioning properly. Advantage #2: Dental implants are easy to care for. With dental implants, there's no complicated removal, cleaning, or soaking process to keep them clean. Not only do they look like natural teeth, they can be cared for in the same manner. Although they do not decay, keeping the teeth and gum tissue around them healthy is highly important. 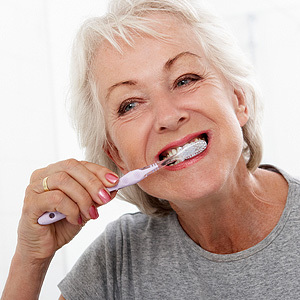 Brushing twice a day, flossing at least once, and staying current on checkups with your Hollywood dentist should be all you need to keep your dental implants looking great. Advantage #3: Dental implants are long-lasting. By following the care regimen described above, there will be no need for your Hollywood dentist to replace your dental implants every few years. While other restorations can wear down or loosen over time, dental implants have the stability to last for several decades, even a lifetime. This makes the investment in dental implants even more appealing when you consider the money you'll save in repairs and replacements over the years. Ready to get started on your journey to a healthier, more beautiful smile? 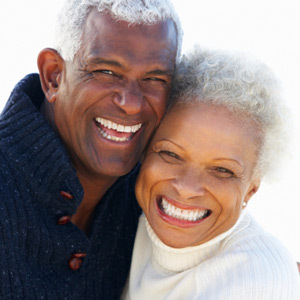 Call Parker Dentistry in Hollywood, FL today to set up a consultation about dental implants!